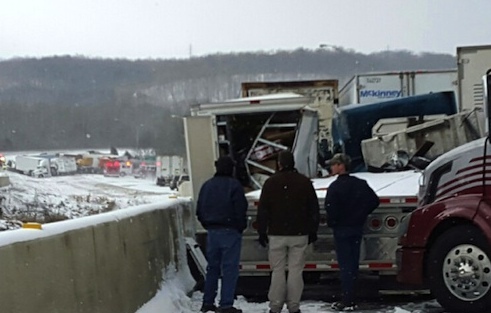 Whiteout conditions and speed are blamed for Tuesday’s chain reaction pile-up involving multiple jackknifed semi-trucks and about 40 vehicles, shutting down the I-74 in both directions in southeast Indiana. 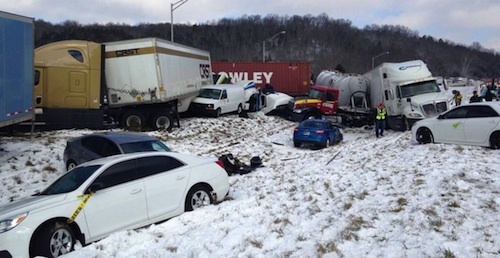 According to the Indiana State Police, a "sudden squall of snow caused whiteout conditions" on the stretch of highway near the Indiana-Ohio state line and a truck driver going too fast for the slick road conditions, caused his semi-truck to jackknife and ignite a 30-vehicle chain reaction pile-up at around 11 a.m. “What we know is this first semi up here, the North American was going too fast for the existing weather conditions, lost control and jackknifed,” said ISP Sgt. John Bowling. Police say that just as the first truck lost control, another semi came up over the hill, couldn’t stop and thus began the chain-reaction crash. Then, a second pileup involving more than 10 vehicles happened less than a quarter mile behind the original one. The two pile-ups left a chaotic trail of semi-trucks, cars and debris for a half-mile stretch and forced closures of both eastbound and westbound lanes for hours. Miraculously, everyone survived and no serious injuries were reported. 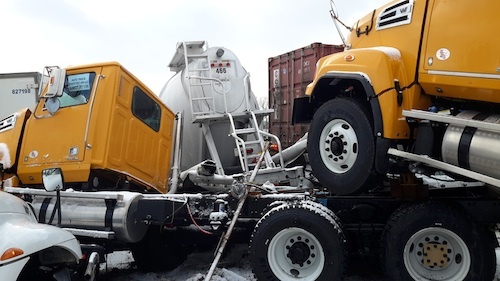 "The first pileup involved mostly commercial vehicles, and a lot of trucks were left in pieces. There's quite extensive damage on most vehicles in the pileup, and some are completely totaled. Six people on scene were transported to local area hospitals for non-life threatening injuries, which is amazing, considering the circumstances," confirmed a spokesperson for the Indiana State Police. Sgt. Bowling said that the Salisbury Rd overpass and I-70 is known for crashes because overpasses are elevated but it still comes down to drivers. “Weather does not cause a crash your driving behavior in that weather is what causes a crash.” Indiana State Police also said that the investigation is still ongoing and criminal charges are possible. OMG????? U TURN??? I-40 eastbound MM 223 Arkansas Just occurred. Noooo is this for real? Yup Rolling west, decide he needed east. No joke!!!!! Fired I'm sure. No U turn policy. Looks like he stuck.. his landing gear on the ground. You gotta be quicker than that! Because they have 75% less traffic. I-70 and I-40 are your main routes for "cross country" runners. I70 sees A LOT more traffic than I-90 or 94 does in Montanta and the Dakotas. And most your rookie companies don't go up that way either. I94 and 90 in Montana, don't even compare to i70 in Indiana. Montana even at its "rush hour" in Billings, Butte do not see the amount of traffic i70 does from Indiana going into Ohio. The only time I have ever hit a traffic jam in Montana was in billings during construction season and they had everyone down to 35 and shoved off on the rumble strips. Ohhhhh look at all the steering wheel holders ! It's the committee!!! Tell me again how all you super truckers with mass regulations and ELOGS are that much safer ? More regs ,more pile ups , more super truckers ,that are so smart they listen to people who never drove a day in their life..... Who think they make the rules ... And make the road safer ? How many pile ups back in the 90's ,80's ,70's ..... Compared to now ..... Ohhhh so much safer !!! Way to go !!!! And us owner operators are not (hyped) up on stuff in the left lane , that's large company b.s and it's not proper of you to stoop to a lower level of life like so . Indiana is most the problem Ohio and pa have salt trucks waiting for the snow.I was in Indiana Tuesday morning and not a salt truck to be found and other problem is boneheads tailgating like a nascar restrictor race just waiting for the big one to happen. Yeah, and figure out how to get the highway dept in Dearborn county to get out there earlier. Sand works in Michigan. 2-3 Years it's depending on company,even then with the right connection all things can be worked out or overlooked .. I bet that Indiana scale house filled up fast while people were waiting for that to get cleaned up. im planning on getting a yaesu 991 too!! not just cb, but all bands 100+watts, cb is good for 5-15mi, ham.... if done right.. can go all around the world!! The problem is people don't use CBs as much everyone is too worried about texting or calling everyone. Insurance should not pay a dine of it. Swift was taking the advice of their safety message and shut down or got out just in time. WEATHER CHECKS SHOULD BE PART OF YOUR PRE MID AND POST TRIP INSPECTIONS!!! PLAN YOYR DRIVING AROUND THE WEATHER! !